North Korea has demanded the release of its ship detained in Panama with what appear to be missile radar and other weapons loaded in Cuba. “The Panamanian investigation authorities rashly attacked and detained the captain and crewmen of the ship on the plea of ‘drug investigation’ and searched its cargo but did not discover any drug,” North Korea’s Foreign Ministry spokesman said. “This cargo is nothing but aging weapons which are to send back to Cuba after overhauling them according to a legitimate contract,” the spokesman was quoted as saying by the official KCNA news agency. 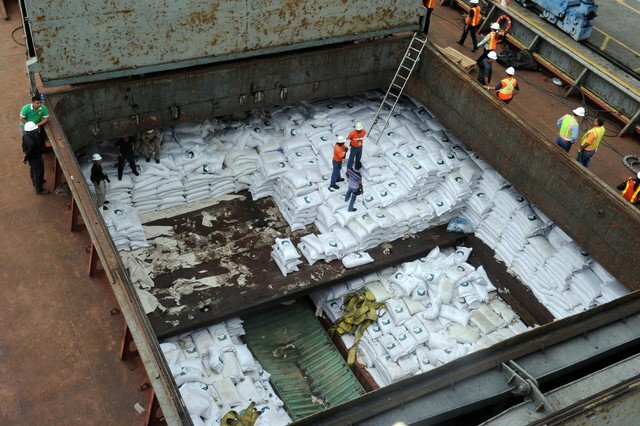 Panamanian authorities seized the North Korean freighter and found what appeared to be components for Soviet-era missile radar system under sacks of brown sugar. The ship was stopped last week as it headed into the Panama Canal and authorities arrested the crew on Monday after finding undeclared missile-shaped objects, a potential violation of UN sanctions linked to the North’s nuclear and missile programmes. Panama said on Wednesday that it had asked the UN to determine the legality of the cargo. Cuba, which has close diplomatic ties with North Korea, said the cargo contained “obsolete defensive weaponry” being sent back to North Korea for repairs and included anti-aircraft missile batteries, disassembled rockets and fighter jet parts. Security experts said there was a possibility North Korea was trying to import the equipment and the explanation about repairing the items may be a disguise. Some reports claim the ship appears to have violated U.N. arms embargo on North Korea. North Korea has been under wide-ranging sanctions under Security Council resolutions since 2006 that ban trade of most types of weapons after conducting missile and nuclear tests in defiance of international condemnation. It tested a nuclear device for the third time in February that led to the adoption of the latest Security Council resolution that tightened the sanctions regime.